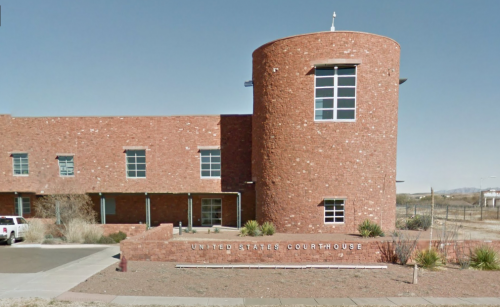 On Wednesday evening, 3 Guatemalan women, who were picked up by Border Patrol agents near the Presidio/Ojinaga Port of Entry on May 14 were tried in a federal courthouse in Alpine. A judge found all 3 women guilty of illegal entry to the United States. This kind of trial isn’t necessarily anything new. But these women are part of a recent wave of undocumented immigrants who have become targets of the Trump administration’s zero tolerance order. They were caught crossing with their children. Officials separated them at the border, and they’ve had no contact since. MORALES: Joining us now to talk more about these family separations and this trial is Marfa Public Radio’s Sally Beauvais. She was at the federal courthouse in Alpine last night, where a trial for these women didn’t wrap til around 7pm. Sally, thanks for joining us. BEAUVAIS: Happy to be here Carlos. MORALES: So what was the scene like in the courtroom yesterday? BEAUVAIS: So it’s really important to understand that this was a small criminal trial, not an immigration trial – where a judge might take on an asylum claim or removal proceedings might happen. Illegal entry into the United States is a federal misdemeanor. And that’s been the case since before the Zero Tolerance order went into effect. We’ll get into more of that later. MORALES: Headphones so they could hear a translation of the proceedings? BEAUVAIS: Exactly. We heard testimony from some of the Border Patrol agents who booked them, and the attorneys argued over whether the women actually entered at an authorized location because of its proximity to the port of entry in Presidio. MORALES: So Sally, how much did the fact that they crossed with children actually factor into this criminal trial? BEAUVAIS: Well, it was interesting. The children were kind of written out of the trial by default in a way. Whenever the women’s defense would bring up the kids, the US Attorney would object due to relevance. But towards the end of the trial, one of the women did testify. And the judge let her tell her full story of fleeing extortion, and threats of violence in her small town in Guatemala. Through tears she talked about how she and her child were separated when at the border. And her attorney, Federal Public Defender Chris Carlin, made it clear that the women have had no contact with their kids since being separated nearly a month ago. All 3 of them have sons, two are 8, one is 9. And Carlin was finally able to confirm just ahead of the trial that all 3 kids are at a foster care facility in Manhattan. But ultimately that didn’t have much of a bearing on this particular trial, since the point was only to determine whether they’d entered illegally. MORALES: And what happens next for these women? BEAUVAIS: Essentially, the women are handed off to the custody of Immigration and Customs Enforcement, or ICE. And actually, that would have been the case whether they were acquitted in criminal court or not. So they’ll return to Sierra Blanca, where they were held first as criminal detainees, and now they’ll be held as immigration detainees. So essentially the color of their jumpsuits will change from orange to green, but they’ll be back in the same federal detention site. At least one of them is going to try and make an asylum claim, but all 3 face the prospect of deportation back to Guatemala. MORALES: And the kids? Why are they so far away? BEAUVAIS: It’s a bit of a mystery and hard to get information as to why the kids are in Manhattan. Chris Carlin’s team says that in past child & parent separation cases here, the kids have almost always gone to shelters in El Paso. And he says there’s really no guarantee that the kids and parents will be reunited, especially prior to the the women’s potential deportation. Immigration authorities do say in general there’s a process in place for reunification. But there’s no mention of the children in these women’s booking documents that the court processed yesterday. And on top of that, the women live in rural Guatemala. They don’t necessarily have legal addresses beyond the name of a village. So with their kids so far removed, Carlin, at least, is skeptical of the reunification process. MORALES: So if we zoom out a bit here Sally, how is this situation any different from one month ago, before the administration’s “zero tolerance” order? BEAUVAIS: So basically, nothing has changed with the law here. But in the past, prosecutors and immigration officers had a wide discretion as to whether to bring criminal charges against folks crossing, and often skipped right to civil proceedings to save legal resources for the important cases. And now with Attorney General Sessions’ order to prosecute all people crossing illegally, these criminal proceedings are happening more frequently, and clogging up the courts. And it’s the criminal prosecution that is key in the child & parent separation cases. Because when the adult is apprehended for a criminal charge, a child cannot be detained with that adult in a criminal facility. And that’s why we’re seeing children being handed off to Health and Human Services at the border, and separated from their parents. This entry was posted in KRTS News and tagged Alpine Federal Courthouse, carlos morales, Illegal Immigration, Sally Beauvais, Zero Tolerance Policy. Bookmark the permalink.